Fig. 64. 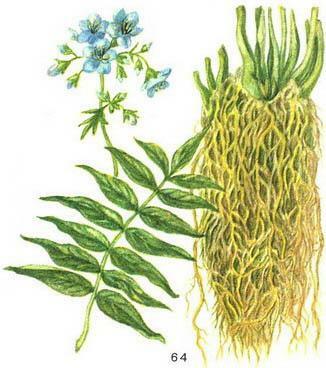 Polemonium caeruleum L. (right - rhizome with roots). Polemonium caeruleum L. (Polemonium coeruleum L.) - cultivated plant. The roots and rhizomes contain saponins. Tincture of roots and rhizomes (7 : 200) or broth (6 : 200) 1 tablespoon 3 times a day (after a meal) is used as an expectorant. Broth cyanosis with broth of rhizomes Valerian (30 : 200) designate (1-2 tablespoon before going to sleep) as a sedative.